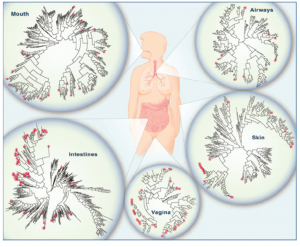 The “microbiome” is a hot topic in respiratory medicine, with researchers from diverse fields such as chronic obstructive pulmonary disease, bronchiectasis, pulmonary fibrosis, and lung transplantation seeking to use the newly accessible technology of bacterial ribosomal RNA sequencing and related technologies to characterize airway bacterial communities and to determine the extent to which “dysbiosis” may contribute to the pathophysiology of lung disease. 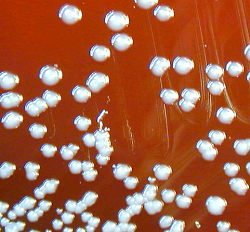 Researchers are looking at how shifts in the bacterial communities in people’s airways might contribute to their lung disease and its progression. What is the Human Microbiota? The human microbiota consists of the microbial colonies found on or in the body. Ideally, they are benign and actually beneficial. 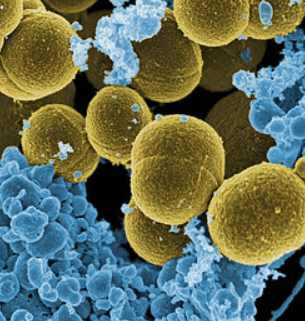 A balanced microbiota has colonies that compete with each other for space and resources. In the digestive tract, they help with digestion. On the skin, in the lungs, and elsewhere, they help protect the body from penetration or overgrowth of dangerous microbes. What is Dysbiosis? It is an imbalance in bacterial colonies in the body. The author, James D. Chalmers, M.D., Ph.D. of the article above, describes three ways for dysbiosis to occur in the lungs. Invader: A new organism enters the airways and disrupts the existing communities by outcompeting other bacteria for resources, resulting in a loss of diversity. Outgrowth: An outside factor such as antibiotic use or a viral infection allows one organism already existing in the community to outperform others and become dominant. Immune Selection: An inflammatory event, which activates the immune system, causes an attack on organisms in the community, killing susceptible ones and leaving tolerant/resistant ones. The author notes that there are likely other models for the creation of dysbiosis, and these can be more complex and can occur simultaneously. 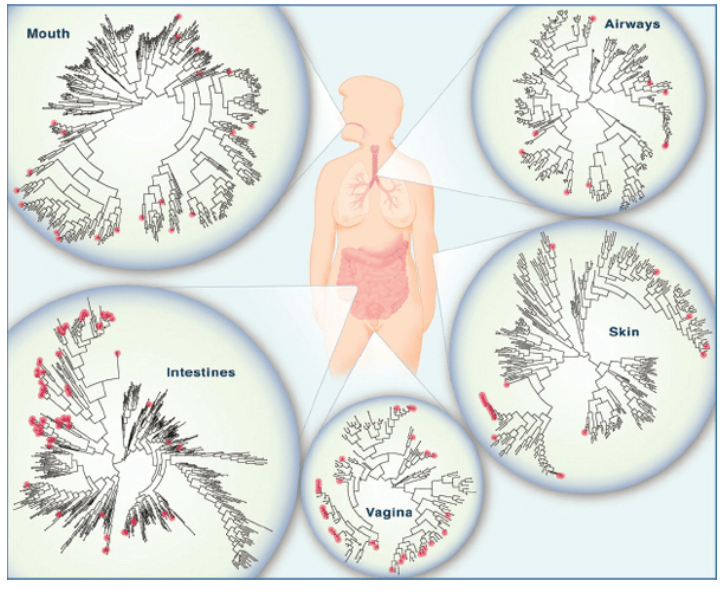 The image below comes from the National Academy of Sciences, The Social Biology of Microbial Communities: Workshop Summary (2012) and it shows bacterial species diversity in various areas of the body. Written by: Melissa75 on November 18, 2016.